The Third Half: Premier League Preview: Bloomfield Road Opens, Will We See Another 6-0? Premier League Preview: Bloomfield Road Opens, Will We See Another 6-0? Round three of the Barclays Premier League sees Blackpool host Fulham in their first home league fixture since being promoted. We also see Kevin MacDonald in what could be his last game in charge as interim manager of Aston Villa. The other strange anomaly that seems to be the question of the early season is will we see another 6-0 result? With four such results already through the first 2 weeks of the new season, it will be curious to see. All time are Eastern and TV schedule is subject to change without notice. Saturday 7:45 am (Live on ESPN2 and ESPN3.com): Blackburn Rovers v Arsenal. Arsenal looked much better last week, while Blackburn did not impress. Arsenal will want to forget their last trip to Ewood Park (a 2-1 defeat last season), and I think they will do so in style. Prediction: Blackburn Rovers 1 Arsenal 3. Blackpool v Fulham (Live on FoxSoccer.tv, On delay Sunday 9:00 am FSC): Blackpool has ridden one hell of a roller coaster in last thirteen days. They go from top of the world after beating Wigan, to now coming as close to hitting rock bottom as a team can get after losing in extra time to MK Dons in the League Cup. Fulham used the fight they had in earning a draw against Manchester United to pick up a resounding League Cup victory midweek. This is the match I wish I could watch live. The party that will be going on by the sea will incredible to see. On the pitch, I don't think it will go well for the home side. With all the momentum from the opening week gone, not even the home crowd will probably be able to will their side to victory. Fulham will look to silence the crowd quickly, and while I think Zamora will do so, I don't think that the crowd is going to be quiet for this one. 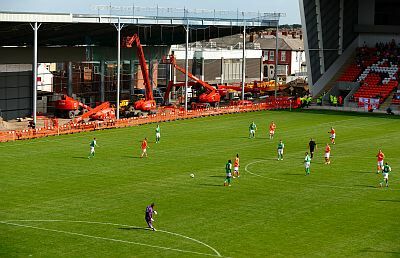 Even in defeat, Bloomfield Road will be a sight to see on Saturday. Prediction: Blackpool 1 Fulham 4. Chelsea FC v Stoke City (Live on FoxSoccer.tv and FS+): Chelsea will not be winning 6-0 on Saturday. If they do, I'm convinced this competition is rigged. Stoke City have not looked great to start this season, but their fight last week tells me they will give a good account of themselves. At least it will be better than Chelsea's 7-0 victory last year at Stamford Bridge. Prediction: Chelsea 2 Stoke City 0. Tottenham Hotspur v Wigan Athletic (Live on FSC): At least there will be plenty of goals in this one. The only problem is I think Wigan Athletic will make it four games in a row that they haven't scored in the Premier League. Tottenham will have their way in this one. Prediction: Tottenham 3 Wigan Athletic 0. Wolverhampton Wanderers v Newcastle United (Live on FoxSoccer.tv, on delay FS+ at 6:00 pm): Was last week a fluke for Newcastle United? I think it was. This could be the toughest game to figure out this week. Both have not shown any early season consistency, and I think that will continue here. Prediction: Wolves 1 Newcastle United 1. Saturday 12:30 pm (Live on FSC): Manchester United v West Ham United. If there is any game this weekend that could produce a 6-0 result, this is it. West Ham are that bad and Manchester United have the perfect opposition to get out their frustration from last week's 2-2 draw. With this game being the late game on Saturday, we will probably all get an early start to our afternoon. Prediction: Manchester United 5 West Ham United 1. Sunday 8:30 am (Live on FoxSoccer.tv and FS+): Bolton Wanderers v Birmingham City. Both sides have had identical starts to the season. With Bolton at home, I think they will exercise their opening weekend ghosts by finally finishing a chance at home. However, Birmingham City won't give up, and I think both sides will share the spoils. Prediction: Bolton Wanderers 1 Birmingham City 1. Liverpool v West Bromwich Albion (Live on FoxSoccer.tv, On delay FS+ at 7 pm): I don't expect West Brom to get many points on the road this season. With Liverpool having to make a long trip back from Turkey, they may have a chance here. Then again, I have a better chance of hitting the Powerball last Wednesday. Hint: I didn't. Prediction: Liverpool 1 West Bromwich Albion 0. Sunderland v Manchester City (Live on FoxSoccer.tv, On delay FS+ at 5 pm): If Manchester City can produce just half the performance they put out against Liverpool on Monday, this will be a no contest. Sunderland still don't have a grip on what they want to do going forward. That will hurt them against a side that will absorb all their pressure and counter attack. I do expect Sunderland to try and make a game of it late. Prediction: Sunderland 1 Manchester City 2. Sunday 11:00 am (Live on FSC): Aston Villa v Everton. I just don't get Aston Villa right now. They are in complete disarray. If I'm Kevin MacDonald, I don't want this job. Everton are still looking for something to jump start their league season. If there is any time to be playing Villa, now is that time. I do think Everton will take all three points to cap off an awful seven days in the life of Aston Villa. Prediction: Aston Villa 0 Everton 1. How do you see these games going this weekend? Let us know in the comments below.